The five stages of divorce include cognitive separation, emotional divorce, physical separation, legal dissolution, and spiritual un-bonding. Until the emotional divorce is complete, the physical connection may continue, thus keeping couples still "married" years after the formal divorce. The following article can help you understand the significance of these stages, and why each is important. 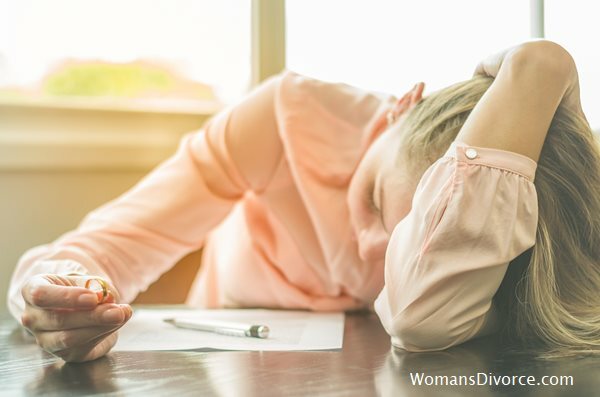 Divorce ranks just above death in severity of stress and is often combined with other stressors, such as marital discord, serious financial problems, a move, single parenting, multiple losses and litigation, all at once. It's a life cycle crisis that presents a crucial period of increased vulnerability and heightened potential. With consciousness, the process can be edifying. Although not easy, it's extremely rewarding, because, in the long run you feel better and learn from the experience, so you don't have to repeat the same mistakes. Divorce consists of several stages: Cognitive, emotional, physical, legal and spiritual. This order isn't usually what happens, and explains the "Divorce Court" melodrama - couples making the legal separation while they are still caught up in the drama of their relationship. They haven't separated emotionally, though they're physically apart. The emotional separation is the cornerstone for transformation and is my focus. Usually, the family has lived with marital problems for some time. Discord may have increased or gone underground to maintain a cordial facade. Gradually one or both spouses become willing to risk the unknown and pain of divorce - it appears preferable to the pain they're already in. The cognitive or mental separation isn't so much a decision to divorce, as a setting of intention, usually long preceding the actual decision. Generally, people set goals or a course of intent before they are emotionally and physically ready to carry them out, such as a job change or a move. The cognitive separation follows a period of frustration and unhappiness. Once the decision is verbalized, the coping behavior and degree of crisis experienced will vary depending on the degree of preparation. Naturally, it's optimal if the family can talk openly and problem-solve the anticipated changes and solutions. More often, there is high dysfunction and open communication never existed or has previously broken down. Where there's no talking, fear and anger intensify and reactivity escalates. If the decision wasn't mutually arrived at, the spouse left is less prepared and experiences greater anger and depression; the one leaving feels guilty. Confusion usually sets in, and roles, rules, and parenting deteriorate. The physical separation is simply that; however, couples may continually reunite until the emotional divorce is complete. The legal dissolution is the socio-economic and cultural separation. As a lawyer and therapist, it is at once apparent that unresolved emotional conflicts fuel adversarial posturing. The legal divorce can be a long, drawn out battle in which couples stay connected through anger by breaking agreements and violating court orders, or by taking either intransigent or ever-changing positions, reflecting their inner conflict and inability to separate - trying to hold on, and at the same time let go. The spiritual connection is ephemeral, without time or spatial reference. Some suggest that once established, it's never severed, and remains following the emotional separation. Strong emotions are absent; instead, it's marked by feelings of unconditional love, caring, and vulnerability to the other person. The task of emotional separation involves un-bonding romantic and dependent aspects of the relationship, and mourning. This is the stage where growth and transformation unfold. It includes disengagement of games, role definitions, and family expectations, and understanding why you selected your partner, why you stayed, and the "dance" you do over and over that doesn't work. Growth comes from taking responsibility for the marital problems, rather than blaming, and finally changing that "dance." It means seeing your partner clearly and risking new behavior, which will undoubtedly meet resistance from your mate, since you're changing the dance steps and refusing to do the old routine. It is different for everyone, but some examples are a passive spouse getting angry, or a volatile partner good-humoredly walking away from an argument; asking for what you really want and need; doing something important for yourself despite your partner's objections; refusing to tolerate some unacceptable behavior of your spouse that you've complained about forever; taking a solo vacation; or refusing to do something you felt obligated to do, but have always resented. So in emotionally un-bonding, people really do become different, in the sense that they have a choice of new responses and behaviors. The drama subsides and marital structure gradually falls away. Ideally, the physical and legal separation can then follow more smoothly. If the process of emotionally un-bonding is not worked through, the emotional connections will undermine the couple's attempts to move on in their separate lives. As a result, couples are basically still "married" years after the formal divorce, if only to maintain their connection through court battles or by ritualistically celebrating holidays together ("doing so for the children's sake"). One such couple, who had been divorced for many years, still lived on the same property in separate houses, yet maintained distance through their legal hostilities. Another divorced couple lived in the same neighborhood, because he provided transportation for her and she felt the need to rescue him and help him through his depression. Another aspect of working through the emotional divorce is dealing with the emotions of ending of a relationship, including depression, anger, and fear about the transitions that will follow. Facing the unknown can be fearful. Divorce represents a lot of changes. It may mean a job change, moving to a different city or school, or having to go back to school or enter the work force after years of being a homemaker. And there are the accompanying losses, such as financial stability, mutual friends and former in-laws, and possibly your home. Not only do you have to deal with the changes to your lifestyle, but there is also the loneliness and lingering thoughts about what might have been. It also involves the loss of identity, as a husband, a wife, and possibly even as a parent. In order to successfully move on, all these losses must be mourned and the fears dealt with. Starting to work through these grief issues before the actual divorce can help smooth the way. Easing our attachments to the things we hold most dear allows for more space and flow within us, the possibility of new experiences, and the opportunity to meet as yet unknown parts of ourselves.